The reigning Sovereign holds the Royal Appointment of Captain General and, in this capacity, serves as ceremonial head of The Royal Regimental of Canadian Artillery. From 1930, when HM King George V was pleased to accept it, until 1952, the appointment was titled Colonel-in-Chief. During a guest night at the Royal Artillery Mess at Woolwich in December 1950, His Majesty King George VI expressed a desire to change his title from Colonel-in-Chief to Captain General. This change was implemented on 26 January 1951, thus reviving a rank dating from the fifteenth century. The rank of Captain General had been replaced by that of Field Marshal in 1736 although it did not actually disappear from common usage until about 1799. 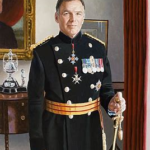 The Royal Canadian Artillery requested that His Majesty change his Canadian title as he had done for the Royal Artillery, and on 10 January 1952, His Majesty became Captain General of The Royal Canadian Artillery. 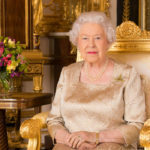 Her Majesty Queen Elizabeth II was graciously pleased to assume the appointment upon her coronation in 1953. 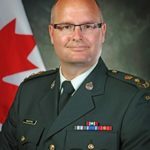 The highest-ranking Artillery General Officer currently serving in the Canadian Armed Forces is deemed the Senior Serving Gunner. 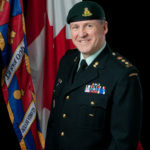 In this capacity, he champions the professional interests of The Royal Regiment within the Canadian Armed Forces and advises on all matters of significance. The Senior Serving Gunner co-chairs Artillery Senate and chairs Artillery Council. 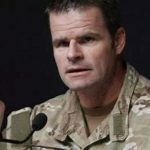 As “Branch Advisor”, the Director serves as the focal point for Royal Regiment identity and provides essential input to the maintenance of the good health of all artillery military occupations. 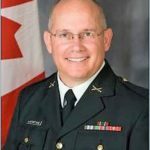 The Director reports directly to the Commander of the Canadian Army on matters related to force development, force employment, training and doctrine, professional standards, career patterns, trade specifications and structure. While having overall responsibility for the Regiment, the Director is primarily focused on the operational aspects of The RCA Family Strategy – Lines of Operation 1 (Force development and employment) & 2 (Leadership succession). 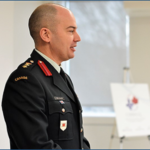 The Regimental Colonel’s primary responsibility is to provide leadership for Lines of Operation 3 to 5 (Nurturing the Regimental Family institution; Connecting with Canadians; and, Celebrating our Heritage) of The RCA Family Strategy while recognizing that the Director of Artillery remains primus inter pares, and is the primary interlocutor with the Army Staff. In exercising his functions, the Regimental Colonel is responsible to the Artillery Senate, is responsive to the Colonel Commandant, and coordinates his efforts with those of the Director and the RCAA. Given the nature of Lines of Operations 3 to 5 issues, the Regimental Colonel remains mindful of the support stakeholders such as Honoraries, retired members and others can bring to bear in advancing issues. Helps ensure that the traditions and history of The Royal Regiment of Canadian Artillery are maintained through the operation and maintenance of The RCA Museum and RHQ RCA. 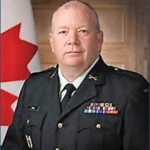 The Regimental Sergeant Major, RCA (RSM RCA) acts as the senior Artillery NCM advisor to the Director of Artillery and the Canadian Army Sergeant Major. The RSM monitors and advises on the collective concerns and issues of personnel, artillery distinctions and dress, and also promotes and maintains standards of military professionalism within The Royal Regiment. The RCA Non-Public Property Board of Directors. The Master Gunner St James’s Park is the ceremonial head of the Royal Regiment of Artillery and channel of communication between the Regiment and the Captain General. The appointment was instituted in 1678 and originally known as Master Gunner of Whitehall & St James’s Park. The earlier Master Gunners were responsible for the artillery defence of Whitehall Palace and the Palace of Westminster. The appointment of Master Gunner St James’s Park is held by a distinguished Royal Artillery Officer selected by the Queen in her capacity as Captain General, on the advice of the Colonels Commandant of the Regiment and is according honorary status as the senior Gunner of the Commonwealth. The Master Gunner last visited Canada in 2016.